Introducing to you now a new Basic aluminium sub-platter with simpler design (more cost effective as requested by many) but keeping to the theory of "light mass" concept. Why a light mass sub-platter? What about the expected performance in comparing with a heavier mass design? From moment of inertia* point of view, the sub-platter which is placed in the inner 1/3 segment (together with the glass platter assembly), contributes very much lesser to the moment of inertia as compared to similar mass at the outer 2/3 segment of the platter. So I believe it's better to keep the sub-platter light. Swapping to a heavy sub-platter would not be my choice as it would add unnecessary load to both the motor and bearing hub without much benefit to the moment of inertia. In fact I like the idea of underslung platter (like the new RP6 platter) which provides more mass at outer rim/segment. Roughly in calculation, replacing a solid aluminium sub-platter to RP6 would add a whopping ~240g(~8 oz) of extra load as compared to the total weight of stock phenolic sub-platter plus cap. The same goes for a solid full size metal sub-platter for RP3/P3/P5, adding ~120g (~4 oz) extra load comparing to the stock phenolic sub-platter. In short, a heavy platter together with a heavy solid metal sub-platter is not a good combo as it could, very well push the system (motor and bearing hub) into "overload" conditions. We have to understand that by any measurements, the Rega TT motor is a "tiny" one of several watts and hence we shouldn't simply add any amount of load as we like. 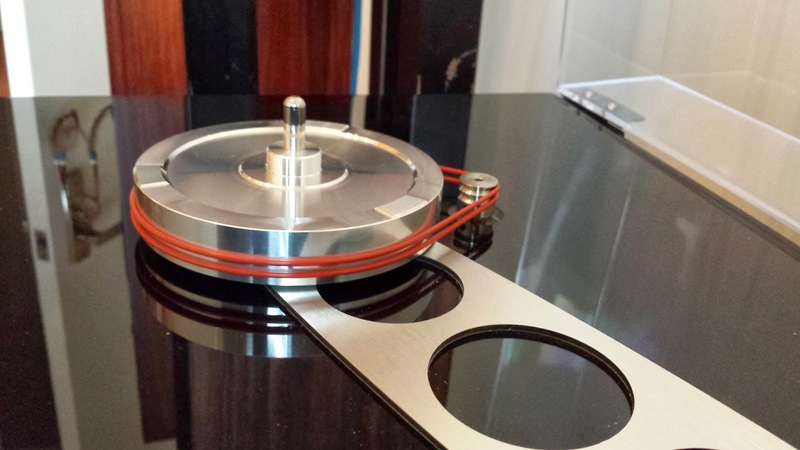 Consider upgrading to a heavy RP6 metal sub-platter (adding 240g/~8 oz), a heavy stainless steel record clamp (adding 450g/~15 oz), a heavier after market platter (adding another 200g/~6.5 oz). The total extra load added would be 890g/~29.5 oz which is about 40% over the stock RP6 platter/sub-platter combo! I guess even Rega RP6 TT designer would forbid!! So in my humble opinion, it's better and safer to upgrade to an underslung platter with more mass at the outer rim together with a light mass metal sub-platter to achieve higher moment of inertia without the risk of over-loading the TT! That's the reason in designing my aluminium sub-platters, "MASS" is one of the important factors I seriously consider. Other than as rigid as possible, it's also designed to be as light mass as possible. To achieve this, substantial part of the aluminum alloy mass is dug out carefully from the sub-platter. And anti-resonance pattern is crafted at the same time into the alloy to produce a unique looking sub-platter. Besides, it's also more "stable" as the combo mass runs at a lower center of gravity(CG) which would result in less stress and wear at the bearing hub wall. *Note: Higher moment of inertia would increase speed stability, hence pitch stability, especially for single-belt driven Rega TT. 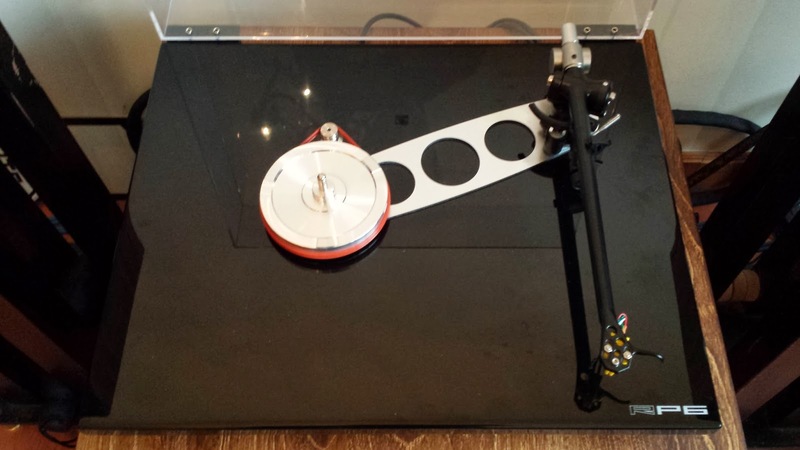 Darren from Manchester -" it has always run fast..."
I have a Rega P3, about 10 years old, which I have owned since new. The dealer upgraded the motor for me shortly after i bought it, and it has been fine ever since, except that it has always run fast. This has not got any worse but I am growing intolerant of it and am on the verge of buying another TT. I sent him the special model ALSPB sub-platter for reducing the speed of his TT. Thank goodness, his problem is now finally solved. Sorry for the delay. I nearly responded with the new email "subject" of "Rega running slow......", as at first it seemed if the new sub-platter had overcompensated for the original speed problem....but a trip to my local dealer on Saturday resulted in a happy ending. So to give the full story - I fitted the new sub-platter. Your instructions were very clear and it was really straightforward. Because I was changing the subplatter I had decided to buy a new standard Rega belt to make sure everything would be working as well as it could. And the sound was improved (nice clear bass, really rock solid speed stability, and everything just sounded "crisper"). But I quickly noticed that the speed was too slow. Must have been revolving about 32.8 or perhaps slightly slower. So I was quickly disheartened that I had the same problem but from a different angle. V annoying. Everything sounded like a funeral march. I resolved to take a trip to my dealer to see whether a ProJect Speed Box SE could be fitted so I could step up the deck's speed by increments to the 33.3 - somewhat drastic, but I had lost patience. The dealer was sceptical about the economy of trying to fit the Speed Box and suggested trying one of the white Rega belts which is somewhat thicker than the standard black one. I was doubtful this would make much difference, and had actually started to take a great interest in a (rather expensive) Fund Firm deck in the show room.........Anyhow, I was pretty amazed to find that the belt change did the trick. The P3 is now revolving about 33.2, which is good enough for me. Whether this means the new standard belt I bought was defective I am not sure, but I am now willing to believe the hype about Rega's more expensive white belt! So the upgrade has really worked. Much better speed (which was the key objective); and the improved clarity of sound and seeming lack of any pitch variability is a great bonus. Money well spent. As you requested. here are a few photos (showing nicely the new sub platter and the white belt too!). I hope you can view them ok. Apologies I could have cleaned the surface of the deck a bit! Many thanks, a pleasure dealing with you. CY Yeung of Hong Kong is a happy RP6 tweaker! He has just added stainless steel dual pulley and silicone belts and he said, "it's simply amazing....."
Just installed the double pulley and red silicone belts. Wow, simply amazing.. Better imaging, pinpoint localization of instruments and voices, better drive and pace. 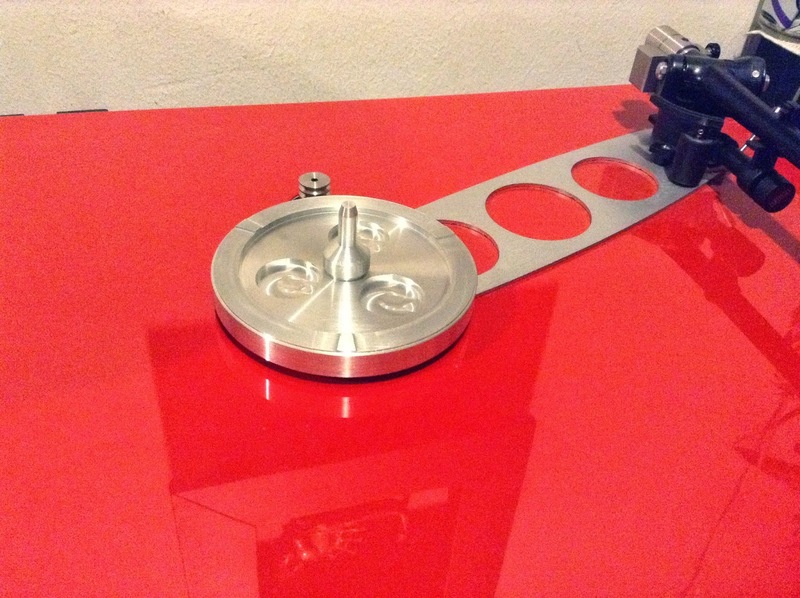 A must for Rega RP6. 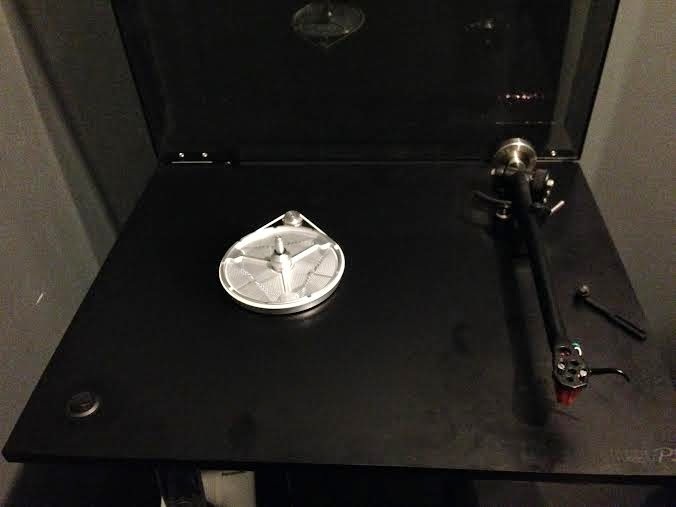 By the way, I have Grovetracer Subplatter installed, but the double pulley has brought the TT to another level. A must for Rega RP6 owner. I am sure that your subplatter would have provided the same effect!